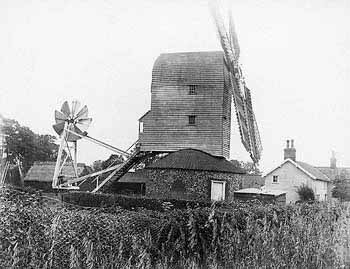 Gissing post mill stood in Rectory Road, Hall Green. 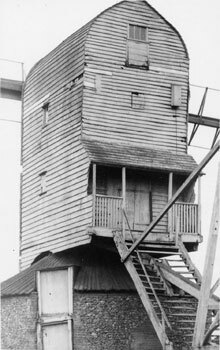 The mill had a dressed flint roundhouse that was plastered inside, a full width balcony porch with a leanto roof and an eight bladed fan set on a tailpole with a two wheeled carriage. The four double shuttered sails had 7 bays of 3 shutters and 7 bays of 2 shutters and drove 3 pairs of French burr stones. However, only one pair of 5 ft stones were listed in 1811. 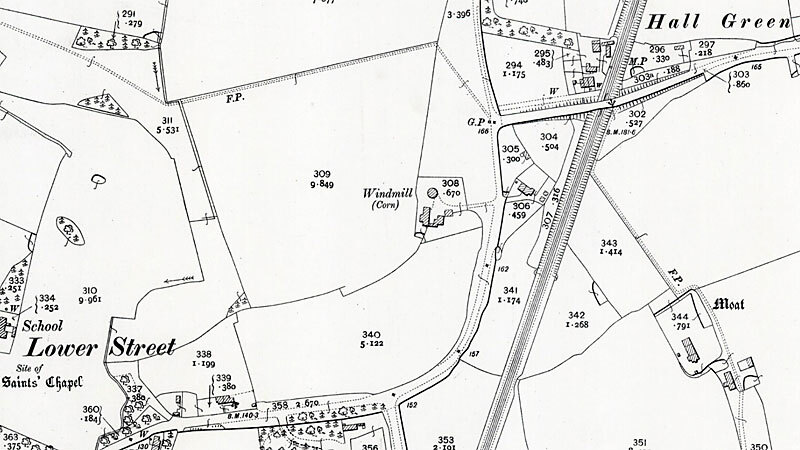 Gissing Manorial Rolls hold a record that on 14th March 1800, John Harrison, a carpenter of Gissing was granted permission to enclose and build on a section of waste land, 7 rods by 10 rods. By 1873 a steam powered mill was also working on the same site powering an additional two pairs of stones. At some point between 1904 and 1922 the steam engine was replaced by an oil engine. Unless sooner disposed of by private contract, of which due notice will be given. All that desirable little FARM in the occupation of Mr. Wm. Womack the proprietor at Gissing aforesaid who has purchased a larger farm & which is the cause of his changing his residence), consisting of a convenient dwelling house, barn, stable, cow house & other outbuildings in good repair & about 30 acres of rich arable & pasture land. 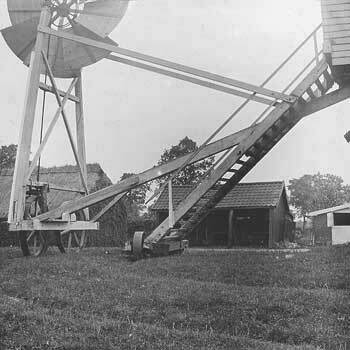 Also a capital post windmill with a pair of 5 foot French Stones, flour mill & going gears at a short distance from the farm, which will be sold together or separately as may be agreed upon at the place of sale. The purchaser may have immediate possession of the mill. The above estate is situated within seven miles of Harleston & seven from Diss, two good corn markets & one mile from the turnpike road leading from Norwich to Ipswich. Apply to Mr. Wm. Brooke, Attorney, Kenninghall, to Mr. Wm. Womack on the premises or to the Auctioneer, Shimpling, Norfolk. Wanted, a Married Man as MILLER. Wind & Steam. Apply John Brooke, Gissing, Diss. Lot 1. A capital POST WIND MILL (with Round House) driving three pairs of French Stones. STEAM MILL with excellent Machinery & Fittings driving two pairs of French Stones, convenient Foreman’s Cottage, Garden, well arranged Granaries, Stables, cart sheds, Outhouses & Piggeries & about 5a.1r.0p. of deep soil Arable LAND. Lot 2. A capital DWELLING HOUSE with Bake house, Granary, Piggeries & Outhouses. Also three COTTAGES with Sheds & Offices, Yard, & Garden. The above Properties are in the occupation of Mr. J.R. Brooke & others & immediate possession may be had except of the Cottages. Particulars of T.W. Salmon, Esq. Solr. Diss & of the Auctioneers, Thornham Parva near Eye & Bottesdale. 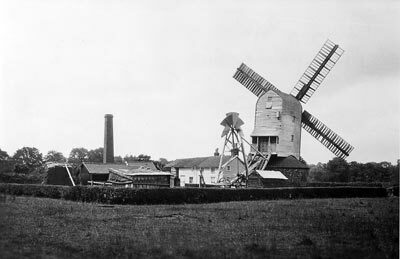 It (Diss_Heywood_towermill) was run by the Ellis family of Holly Farm until about 1875, when Mr. John Brooke, whose father had the post-mill at Gissing, married into the family and moved into Holly Farm. He ran the mill for Mrs. Sarah Ellis for several years until it finished work, & continued to farm there afterwards. Rate 1s. 9d. = 19s. 3d. Rate 1s. 9d. = 17s. 6d. Wanted, a respectable married Man to work a windmill. Apply personally to Mr. J. Brook, Gissing near Diss. Wanted, a Married Man who well understands the trade. On Friday afternoon Arthur, a little boy 6 years of age & son of Mr. J. Brooke, Miller & baker, Gissing, met with a fatal accident. A SEVEN HORSE POWER Portable STEAM ENGINE, with Barn Works, Straw Elevator ... All in good working order. Enquire of John Brooke, Miller, Gissing. WANTED, Married MAN who understands his Business. Wind & Steam. Apply to John Brooke, Gissing, Diss. An inquest was held yesterday, before Mr R T Culley, Deputy County Coroner, on the body of Mr Thomas Garrod, a miller residing in the parish, aged thirty seven years, who was found dead on Wednesday last, suspended by the neck to a beam in the chaff-house, and on being cut down life was found to be extinct. The deceased appeared to have been upset lately in consequence of business matters, and he had expressed a fear that he should lose what money he was possessed of. After hearing the evidence of Mr Farringdon of Diss, Surgeon, and the several other witnesses, the jury were satisfied the deceased was not in his right mind at the time he committed the act, and they returned a verdict of "Suicide whilst of unsound mind". On 29th April 1881, the Diss Express reported that at the Diss Petty Assizes, John Read Brooke, late overseer for the parish of Gissing was charged by the District Auditor for not paying £33.11.5d to the treasurer of Depwade Union. Brooke admitted the charge but said he has no money ...having given over everything to Trustees for benefit of creditors. He was told to pay plus interest of £1.6.6d or go to Norwich Castle for two months. Rate 1s. 8d. for half year = £1. 3s. 4d. Did out of court surrender out of their hands into the hands of the Lords of the Manor and did also …release and forever quit claim unto & use of John Read Brooke, late of Gisssing and now of Fakenham of the said county; miller. All estate right interest of the said Hannah Lydia Norman and John Norman of all the lands, tenements etc to which John Read Brooke had been admitted copyholder on 4th August 1871. States JN and HLN can never lay claim. However, another entry also dated 24th September1886 records receipt of a conditional surrender. It states On 22nd September 1886 John Read Brooke came before the Deputy Steward in relation to a covenant included in an indenture dated 7/1/1880 between Thomas William Salmon of Diss, John Read Brooke and John Norman of Gissing (farmer) in consideration of £500 paid to John Norman by Thomas William Salmon in respect of an indenture dated 11th October 1885 between John Norman and his wife Hannah Lydia and William Salmon. This seems to say that the £500 now belongs to Thomas Melford Bidwell. The Normans seem to surrender to the Lords of the Manor all the property of John Read Brooke. These lands seem to be designated to Thomas Melford Bidwell. John Salmon is ordered to pay Bidwell £500 plus interest on 11th April 1887. However seems to have been suggested that surrender would be avoided if John Norman paid £500 plus interest back to Bidwell. I don’t really understand this, unless Brooke and Norman had mortgaged the copyhold to Salmon who then passed it on to Bidwell. The date of the indenture mentioned (7/1/1880) coincides with when Brooke was going bankrupt and selling off goods and chattels as advertised in the Diss Express. Could be something to do with “Cash Flow“. Not clear what happened but from what follows, Brooke does not seem to have lost the copyhold. John Simpson Brooke, farmer, Diss, comes forward as the son of John Read Brooke deceased seeking copyhold of the land to which his father had been admitted on 10th August 1871 (was actually the 18th August but dates are commonly muddled up). Said to be a parcel of the waste, 7 roods by 10 roods and a certain windmill thereon lately erected and built (late of William Birch Womack). He seems to have been given the copyhold. His father would have been 67 at this time. John Simpson Brooke produces a Deed of Enfranchisement. It goes on to say This indenture made on 7th December 1892 between William Pinder Evasley (Barrister, Norwich) and the Rev Lewis Evans of Truro House, St Germains Place, Blackheath of the first part, Sir Kenneth Hanger Kemp of the second part and John Simpson Brooke of the third part ….. There then follows a very long entry (Pages 41 to 48) discussing the will of the late Sir Wm Kemp and quotes Section 11.8 of the Copyhold Act of 1852. What it seems to boil down to is that Brooke pays £28.16.8d to get the freehold. Checking up on the Copyhold Act of 1852 in the British Library, it is an amendment of three previous Acts but clearly says a Tenant has the legal right to seek from the Lord of the Manor enfranchisement of his copyhold, which, on payment of an agreed sum, would become freehold. (Evasley and Evans are Trustees of the Lord of the Manor). It was noted that 4 of Henry Harris' sons actually attended his funeral. On 19th April 1924 Esther Ann Harris and Henry Adolph Harris obtained a mortgage from the Waveney Valley Ancient Order of Foresters Friendly Society. Esther Ann Harris was the widow of William Whitaker Harris jnr and would have been aged 63 at this time but went on to live until she was at least 80. Henry Adolph Harris was her son. It is said that Henry Adolph Harris died of miller’s lung. Kathleen McKinnon came to see us in July 1993 to have a look around the Mill House. She was a free-lance writer, mostly of poetry, but also of prose. Her interest was that she had lived at the Mill some 70 years before when aged between 3 and 5 years old. The last miller, Henry Harris, was her grandfather. This means she must have been there in the early 20s when the mill was still functional. Mrs McKinnon has written two books - Quiet Ways in 1991 and The Inner Garden in 1992. These are mostly verse but also have articles about Gissing and the Mill. She also expanded on her memories when she visited and in later correspondence. Why she was staying with her grandparents is unclear, but she did go to the local school for a time so it must have been more than just a short visit. In “Sails in the Wind,“ her first book, she describes the activity at the mill and their dependence on the wind. In fact, by then there was an engine in the outbuildings with a huge chimney to supplement wind power. She recollects sitting in the kitchen, which we agreed is now the bathroom, with an adjacent pantry. She describes a “red uneven floor,“ and , interestingly, the entrance hall still has a red tile floor. Each morning, the day began with prayers in the kitchen. Her grandparents were Chapel folk, and Mrs McKinnon recalls visiting ministers/preachers being entertained for Sunday lunch or tea in the Mill House. She described a pond with watercress which is marked on maps, but now filled in. There is still a heavy iron ring where it was, to tether horses brought to drink. Watercress needs clear running water, so there must have been a decent stream there where there is now a muddy ditch. Near the pond was a kitchen garden and in between the two, an outside loo. There is description of bantam hens, tethered goats and milking cows on the property but this may be artistic licence as she later spoke of going each day to collect milk from a local farm. Her grandfather had a pony and trap on which she would go to the weekly Diss Market. Most social activity was based on Gissing with frequent visits to the village shop – still there but no longer a shop. On Christmas Eve, her grandfather had a party for the village children with a proper Christmas tree. Occasionally there were trips to Norwich. This meant cycling on the back of her aunt’s bike to Tivetshall Station (long gone) and then train to Norwich. In The Inner Garden she describes visiting what she calls the Snowdrop Island, but which we call the Snowdrop Wood, sited where the original Hall was. Her description of “crawling across a slimy, lichen covered tree trunk“ to get there is as true today as it was 70 years ago, as indeed is her description of the wood. She tells of collecting bunches of snowdrops enhanced by sprigs of box wood to distribute around the village. Her description in this article of gathering flowers in season to decorate the church is really charming and floral decoration of the church is still as active today. What she could not, or would not talk about was the demise of the Mill about which I have still not got details. She said her grandfather died of “Miller’s lung”, but I am not too sure when. 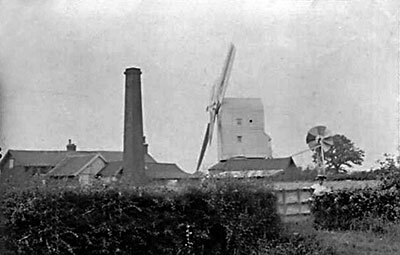 The last dated photos I have seen of the Mill were taken in 1923. Notice stating John Read Brooke to sell Horse, miller’s carts, trade utensils, mill fittings etc…. Notice stating Deed of Assignment of John Read Brooke of his estate and effects to creditors. Meeting of creditors planned for 23 rd April 1880. Mortgage between Esther Ann Harris and Henry Adolph Harris with Waveney Valley Ancient Order of Foresters Friendly Society. 1st September 1986: Conveyance from Peter M. and Edna G. Kenyatta to W. R. and P. M. Cattell.